From one business owner to another, we understand that 2 things are very important: when arranging to move your office; minimizing the downtime your business experiences and staying within budget. 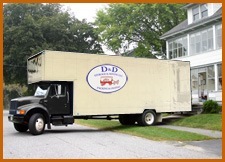 D&D Storage and Moving is available on your schedule and does not charge any additional fees for Cincinnati, Ohio local moves that are conducted after business hours or on weekends. State to state moves and international moves are conducted in conjunction with Stevens Worldwide Van Lines, one of the America’s oldest and most trusted moving companies. We offer complete disassembly and reassembly of office cubicles, desks and furniture as well as full office packing services. When coordinating the moving of office equipment and computers, we are happy to work directly with your equipment vendors and IT professionals to protect equipment warranties and ensure the integrity of your technology systems. Our office movers in Cincinnati, Ohio are second to none. We care for your items as if they were our own, taking extra precautions to ensure your items are kept safe from damage throughout the moving process. We have over 40 years of experience with commercial moving in Cincinnati, Ohio and the surrounding areas. We realizing moving can be stressful and pride ourselves on our ability to make the process as quick and smooth as possible. Looking for the best commercial moving services in Cincinnati, Ohio? Trust D&D Storage and Moving! Call or email us today to discuss your unique needs and to schedule a complimentary estimate.